I’m flat out… well, past flat out, to finish your next story and another one shortly thereafter. One thing about being a self-pubbed author in two boxed-set groups…. there are deadlines to keep me honest! Your new stories will be out very soon! As you’ve probably heard, we’re not only doing a Christmas boxed set this year, but also a Summertime one! Summer Romance on Main Street will be out this month! Keep checking back here to hear when it’s out! In case you’re wondering, yes, I have changed the cover image for Once Upon a Vet School #7: Lena Takes a Foal. Join us for another story in Lena’s series of Once Upon a Vet School! And you will too, when you read Once Upon a Vet School #6: Fifty Miles at a Breath (Page coming soon!) 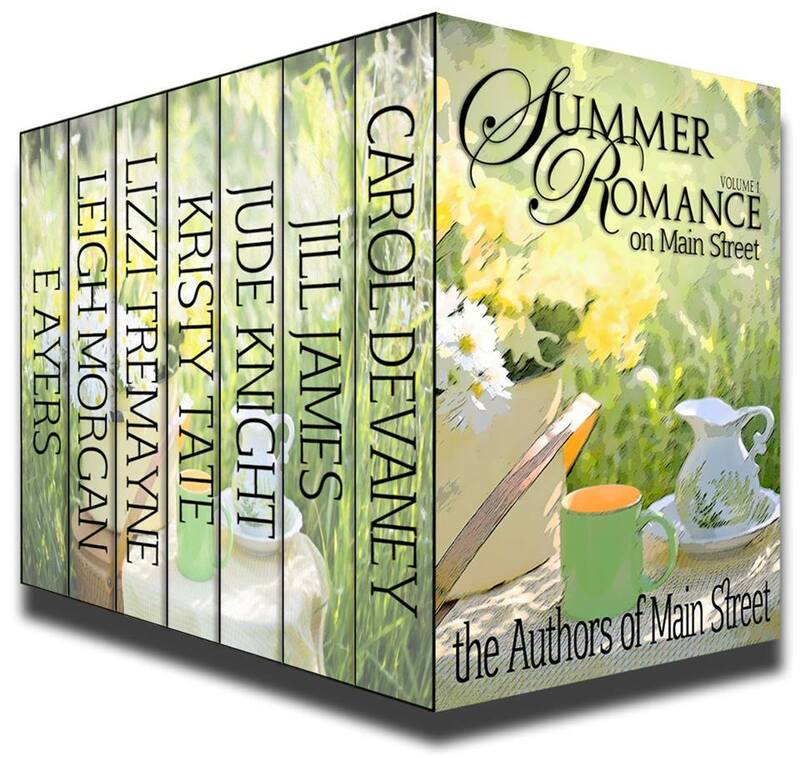 in our upcoming boxed set, Summer Romance on Main Street! I’ve done endurance riding and ride-and-ties myself, plus crewed and vetted for many more. I thought it might be nice to give people a little glimpse into that world. Prince was back in the corral attached to his trailer when I arrived at Blake’s camper. The stallion whuffled softly to me and lipped at the grass I’d found for him. I may be a disaster with men, but I know how to make horses love me. “He’ll leave me for you, if you keep that up.” Blake’s eyes glowed down at me from the open door of his camper. I thought the juice might be safest, in my present state of mind. The comfortable cab-over camper looked well used, but well cared for. Blake caught me looking it over. That got me. I had no idea what he meant. And I probably wasn’t going to find out. Surely he was married. Probably to one of those money- grubbers he’d mentioned last time we spoke. “Let’s go, or will miss dinner.” Blake held the door for me as I climbed down the steps. I didn’t see much of that these days. I grinned over my shoulder as I thanked him, then promptly tripped over the trailer brake. Pull it together. A guy’s nice to you and you melt. I managed to hit the ground with my feet, rather than my head, and stood waiting beside Prince while Blake climbed down—carefully, I noticed. We headed in the general direction of the cookhouse. Blake stopped at this trailer and that to introduce me to his friends. The on-duty ambulance rolled slowly to a halt near us, the driver looking around and talking on his radio. “What’s up?” Blake asked someone. The other ambulance attendant hopped out. “Can you all please clear the area? The chopper is on its way,” he called out, in a loud voice. We moved to the edge of the clearing and searched the sky for a helicopter. Blake saw it before I could even hear it. “He’s going a pretty good clip.” Blake raised an eyebrow at the chopper, racing toward us. Suddenly, it was right above us, coming faster than I could have imagined, dropping like a stone into the clearing before us. It was only twenty feet above the ground, too close for comfort. A graying man walked past them, struggling to lead a gray Arabian as it danced sideways, snorting and tugging at its lead. The man glanced around, and then up to see what was frightening his charge. Suddenly, his horse galloped past me, so close I felt the wind from its passing. I turned back to see if the man was okay, but he’d vanished. Blake dashed off to catch the horse and I ran over to where the man had been. Where had he gone? I peered over the riverbank near where I’d last seen him. There he was. Ten feet down, hunched into a ball on the rocky riverbed, hands and arms cradling his head. His whole body shook. “Are you all right?” I called out, but he didn’t respond. I scrambled down beside him and reached a hand out toward his shoulder. “No!” Blake’s voice rang out from high above me. I froze, but not before I’d touched the hot skin of the man’s shoulder and my world went ballistic. I tried to scream past the fingers digging into my face and covering my mouth, and then a band of flesh-covered steel clamped tight across my throat. I’ve always adored Lena, and Blake’s pretty cool, too. Hope you love Lena and Blake’s story, coming SOON! This entry was posted in Lizzi's posts and tagged #ChristmasBoxedSet, #ChristmasBoxedSet#Babies#OnceUponAVetSchool#LizziTremayne, #lizzitremayne, endurance riding, equine vet, high sierra, high sierras, horse, horse vet, horses, Lizzi Tremayne, Lizzi Tremayne author, lizzitremayne.com, medical, romance, Sacramento, Summer Romance, tehachapi, vet, vet school, veterinary medicine, veterinary school. Bookmark the permalink. Can’t wait to read everyone’s stories. Ah, summer romance!! Looking forward to reading out summer stories! Every one sounds wonderful so far! Sounds like an interesting read, Lizzi!